Protoplanetary disks are baby solar systems, filled with gas and dust grains. Check out Ian’s astrobite from 2011 for a great review of protoplanetary disks and how they evolve. Some of the disks we observe have cleared inner regions of low dust density. Different mechanisms have been suggested for the clearing of disks, including gap-opening by a protoplanet, photoevaporation, and accretion onto the star. All of these mechanisms could be at work in a single disk. HD142527 is a great example of a protoplanetary disk with a cleared inner region. Infrared observations of HD 142527 show an inner disk with a radius of about 10 AU, then a large gap, an an asymmetric outer disk at 140 AU. This suggests that a protoplanet has formed at around 90 AU and has opened the gap. It’s a simple story so far, but now things start to get interesting. The high stellar accretion rate in this system predicts that the inner disk should have been accreted onto the star by now (it should take less than a year). So the material in the inner disk must be replenished somehow. Some of the gas and dust from the outer disk must be crossing the gap to refill the inner disk. This could happen if protoplanets are orbiting near the outer disk, forming a “bridge” of material from the outer to the inner disk. Another interesting feature is that the dust grains in the outer disk don’t appear to form a continuous ring, but instead appear as a horseshoe (see Fig. 1a below). What could cause such a strong asymmetry? The authors of this paper observed HD 142527 at multiple wavelengths to try to understand the system better. The authors used the Atacama Large Millimeter/Submillimeter Array (ALMA) to observe HD 142527 at several different wavelengths. We’ve talked before about ALMA’s exciting new observations of debris disks (like Fomalhaut and AU Mic) and protoplanetary disks (like TW Hya). ALMA can map both the emission from the mm-sized dust grains and from different molecular gas lines in a disk. The results are shown in Fig. 1. There’s a lot going on in this figure, so let’s go through step-by-step. Fig. 1a shows the continuum emission from the dust grains, measured at 345 GHz (0.87 mm). The white contours indicate different fractions of the peak emission. Fig. 1c shows the near-IR dust grain emission at 2 µm from observed with the Near-Infrared Coronagraphic Imager (NICI) at the Gemini Observatory. The central black circle is blocking out light from the star (some of which is leaking out around the spot). The white contours in Fig. 1b and Fig. 1d show the line emission of the CO and HCO+ gas, respectively. Fig. 1b shows that there is CO gas present inside the gap, but it’s probably optically thick, so it’s very difficult to measure the density of the gas to determine if there is a gas gap. The map of HCO+, which is a good tracer for high-density gas, shows the gas in the outer disk, with two filaments crossing the gap between the disk and star. But ALMA can measure more than just the emission from the gas in disks; it can also measure the velocity of the gas along the line-of-sight using Doppler shifting. This disk is not quite face-on; the left side of the disk (as seen in the images in Fig. 1) is tilted slightly away from us, so some of the gas is moving along our line-of-sight. The RGB images in Fig. 1b and Fig. 1d show the velocity maps of the gas. The gas in the blue region is blue-shifted, so it’s moving towards us. The gas in the red region is red-shifted and moving away from us. The gas in the green region is moving perpendicular to our line-of-sight, so we can’t measure its speed. Fig. 1: ALMA and NICI observations of HD 142527. 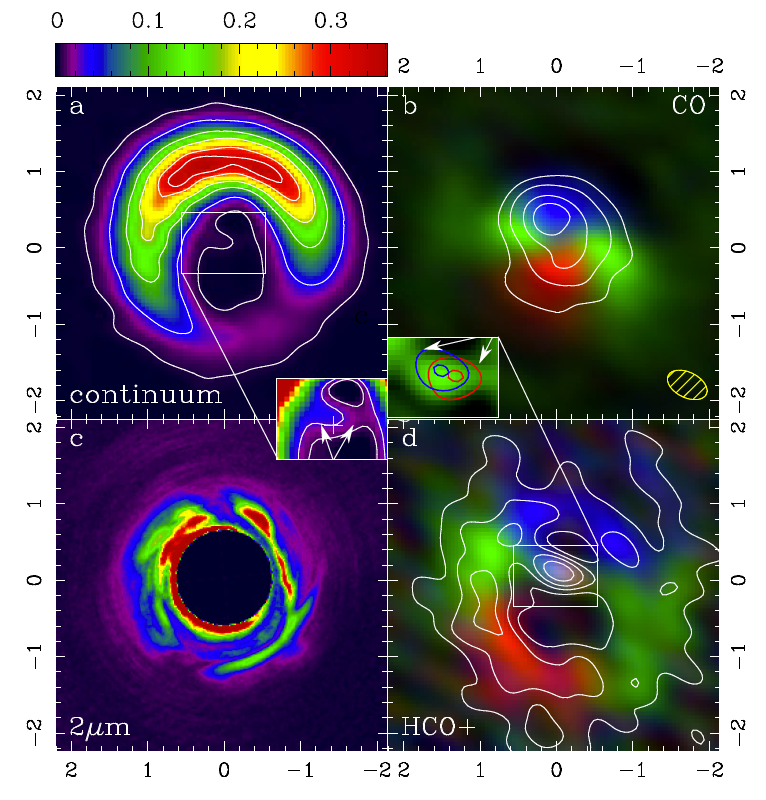 (a) ALMA image of the continuum intensity of the dust grains at 345 GHz . (b) The white contours show CO line intensity and the RGB image is a velocity map of the CO gas. (c) Near-IR 2 µm dust emission from NICI. (d) The white contours show HCO+ line intensity and the RGB image is a velocity map of the HCO+ gas. The authors studied the velocity maps of the gas in Fig. 1b and Fig. 1d to form a model of the disk. Both the CO and the HCO+ gas are moving in Keplerian rotation (normal elliptical orbits around the star). But the HCO+ gas is also seen in the gap, and it’s not in Keplerian rotation there (see inset in Fig. 1d). In fact, the HCO+ gas stretches from the outer disk towards the star in two filaments. The gas in the more distant filament (on the left) is blue-shifted, moving towards us and the star. The gas in the closer filament is red-shifted, moving towards the star. This indicates that the gas is being pulled towards the star, exactly what was predicted for replenishing the inner disk! The authors performed high-contrast IR imaging with NICI to try to detect protoplanets in the filaments that may be responsible for forming these gas bridges, but none were found. However, the density of gas and dust are very high in these regions and would probably obscure all but the largest protoplanets. The horseshoe shape of the dust grains in Fig. 1a is more difficult to explain. The smaller dust grains seen in near-IR (Fig. 1c) do not show a horseshoe pattern, indicating that only mm-sized dust grains are absent from the low-emission region in Fig. 1a. The authors suggest that this may be the result of instabilities in the disk due to a planet, but more studies are needed.